It’s a match made in comic book dreams. A man who protects humanity by becoming a machine, versus a machine who destroys humanity by impersonating a man. The Dark Horse crossover was really just a matter of time, and the game based on it shouldn’t be much of a surprise either. Frank Miller’s comic series went through three different time travel variations before finally settling on the winner of this fight. The game, fortunately, focuses on only one. The convoluted story behind this meeting of metal might (a little Stan Lee for you there) goes a little something like this: As Robocop is the most successful merging of a human mind with robotics, Cyberdyne patterns SkyNet’s neural network using Robo as a blueprint. SkyNet then does its evil deeds and humanity is laid to waste. In the future, the human resistance learns that Robocop was indirectly behind the creation of SkyNet and sends a commando to render him useless. SkyNet intercepts with a load of Terminators, who kill the commando and plan to force Robocop to integrate with OCP’s computers so that Cyberdyne can gain knowledge of his inner workings. Robocop is blissfully unaware of all these proceedings and his place in the future, and continues patrolling Detroit and busting crooks in his own signature way. During a routine gunfight, Robocop finds the resistance commando just before she dies, learns that something strange is amiss, and sets off to save the future himself. Take a quick rest now, that’s quite a lot to digest. An extended text crawl explains some of this at the beginning of the game, but it is ultimately useless, except to give you a very general idea of what to expect. The plot itself is meaningless in terms of the game. But rest assured, you’ll be blasting Terminators and human punks across levels of Detroit and the future. The Genesis version of this game is designed to be a high-adrenaline arcade romp through multiple platform levels based off of scenes from the films. All the enemies from both franchises will also make appearances as bosses, whether it makes sense for them to or not. A few levels offer objectives, like rescuing hostages or destroying cameras, but these are optional and result only in points and health replenishment. 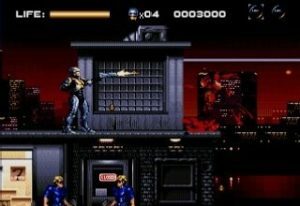 The real intent of every level will be to travel across multiple screens and multiple levels, shooting all manner of bad guys with a variety of heavy weapons, and enduring a boss fight at the end. If you’re looking for something more faithful to the comics, or more focused on plot, the SNES version will certainly fill this role. If you’re looking for an extreme action platformer, this isn’t a bad choice. 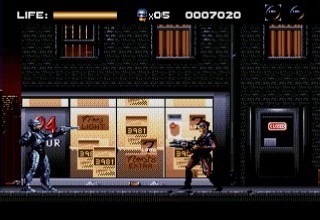 Robocop vs Terminator is mostly known for its graphics, which remain some of the most artistically impressive that the system ever produced. Streets are dark and dingy, lit by dim streetlights casting shadows into dark alleyways. Trash blows by, and gangbangers perch, ready to fire. You’ll even have assassins shoot at you from open windows as you pass by on fire escapes or poles. Later in the game, antiseptic neon-and-glass corporate offices and the concrete ruins of a nuclear-bombed Detroit bring different, but equally impressive, looks to the game. Robocop himself looks exactly like his movie counterpart, right down to the gun-blued metal armor. Muzzle flashes from the guns look as menacing and explosive as they did in the films, and impressively reflect off of his chest and helmet. The character animations are even fairly authentic, right down to Robo’s gunslinger stance as he fires his signature Auto-9. The other aspect RvT is remembered for is its graphic graphics – enemies all die grotesquely imaginative deaths. No one just falls; every enemy blows apart in splashes of blood and limbs, heads spin from decapitated bodies, and Terminators shed their flesh as they’re shot, slowly revealing their metal framework underneath. Music is another high point, as it comes from Tommy Talarico. If you were a serious gamer back then, maybe you heard of him. He’s certainly done his fair share of game music, and made quite a name for himself because of it. If not, all you need to know is that he’s a man who knows what the hell he’s doing. His personal style leans to industrial and techno, and he knows how to drive a lot out of the MIDI-style sound processors of the time (see The Terminator Sega CD edition for an example of his work without such restraints). The music here is pure energy, fast-paced synth, with heavy thumping bass and the Genesis equivalent of power chords. Robotic and metal clashing representations make appearances in the background of the tracks as well, for flavor. It can get a little squelchy at times, as any music for these systems could, and it’s certainly not something you’re going to want to tape to play in your car, but it works well for the pace of the game and the robotic theme. Controlling your cyborg hero is easy, with the button layout you’d probably expect. 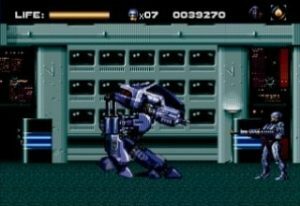 Though Robo moves slowly compared to other game characters, the pace of the game itself is never slowed, and he jumps and climbs like a monkey. Jumping and firing get individual buttons, with the third switching between two weapon slots. You’ll always have your signature handgun in either slot, but either slot can be “overwritten” with a stronger weapon acquired in the level, like homing rockets and bazookas. You’re given control over what you carry this way, and can pick guns for strategic value and use them at the proper time. When you lose a life, you lose the gun in the active slot and replace it with the Auto-9. This way you can quickly switch to the gun you don’t want to keep as your death approaches, and never be unarmed no matter what. This is a plenty violent title, and its reputation for action and gore is well-deserved. The mythical cheat code to unlock the hidden MA-17 version does exist, but its most prominent feature is simply to replace certain male thugs with female thugs, because shooting ladies isn’t nice. The level of gore otherwise doesn’t change. Still, the regular game does a fine job of bringing the two franchises together in a platformer with solid roots, with far more action and excitement than the slower, more plot-heavy SNES version. Certainly worth your time. Impressive action, impressive sound, impressive meeting of the franchises. Not much to it beyond running and shooting. Still, as it takes elements from all the movies, it ends up being one of the best Robocop games even without the Terminators.